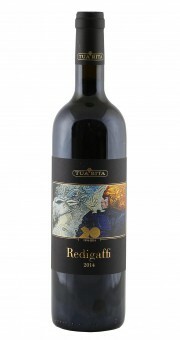 Tua Rita Redigaffi – Benchmark-Wein aus der Toskana, der weltweit Kultstatus erreicht hat. Ein großer Rotwein, der in die Phalanx der besten Merlot-Weine dieser Welt einzureihen ist. Seinen Namen verdankt er einem Bach, der in der Nähe des Weingutes fliest. Der Jahrgang 2000 war der erste Wein aus Italien, der von Robert Parker mit 100/100 ausgezeichnet wurde. Redigaffi präsentiert sich regelmäßig in den Katalogen der weltweit führenden Auktionshäuser wie Christie's und Sotheby's und ist einer der wenigen italienischen Weine, die im Liv-ex Index enthalten sind. Here's a wine that defeats the odds of the difficult vintage with a firm sense of style and confidence. The 2014 Redigaffi is Merlot that benefits from the sea breezes and bright sunshine of Coastal Tuscany to downplay the soggy and cool summer growing season. The fruit tastes ripe and plump with black cherry and red currant backed by heavier tones of spice, leather and tobacco. That the wine is made with care and the upmost attention to detail is evident (one-third of production was lost due to severe fruit selection). Only 8,500 bottles were made. You can taste this in the quality of the wood and the fine tannic management. However, despite all the hard work that has very evidently gone into creating this edition of Redigaffi, this vintage fails to reach the soaring heights of its predecessors—wines that can hover near the 100-point mark in the best vintages. By no real power invested in me, I hereby bestow honorary Californian statesmanship on Tuscan vintner Stefano Frascolla. Rarely have I seen such a laid back and happy-go-lucky personality. I almost expect to see a surfboard hitched to his SUV as he drives home from the beach along the happy trails up to the soft hills of Suvereto on the Tuscan Coast. Stefano’s permanently unruffled manner was put to the test in 2014, a vintage that looked hopelessly wet and cold until a last-minute change to sunshine set things back on track. As you would expect, this blue-eyed winemaker with sandy blonde hair prefers to focus on the good. A vintage like 2014 can prove exceedingly expensive. Stefano sent crews through the vineyard parcels destined to his top wine, the Merlot-based Redigaffi, seven times before harvest. That mean seven crucial passes to drop fruit, trim clusters and complete the other steps required for optimal ripeness. Despite these labor-intensive steps, some 30% of production was sacrificed and only 8,500 bottles of 2014 Redigaffi were produced. Stefano reveals these vineyard notes with a steady smile and looks up to conclude: “I couldn’t be happier with the results.” Spoken like a true Californian. 19/20 Punkte Weinwisser: 18 Monate in neuen französischen Barriques. Das expressive und farbenfrohe Bild auf dem Etikett stammt vom toskanischen Künstler Raffaele De Rosa, ein Freund der Familie aus Livorno, der praktisch von Anfang an die Geschichte von Tua Rita mit seinen Bildern begleitete. Er malte auch das Bild, das am Ende des Barriquekellers zu sehen ist. Dichtes, dunkles Purpurrot. Herrlich klares, trotz der Reife kühles Merlot-Bouquet, Lakritz, ätherische Noten, Eukalyptus und florale Aspekte. Sehr konzentriert und tiefgründig; mit Luft Minze und Blaubeerenconfit ohne Ende. Am Gaumen dieser selten gelingende Balanceakt aus Reife, Kraft und Eleganz, getragen von einer ganz feinen Säure und einer feingeschliffenen, fast schon seidig kühlen Textur. Ein gefühlt minutenlanges Finale, das nicht aufhören will. Hervorragendes Resultat für ein Jahr, das Stefano Frascolla als «nicht ganz einfach» in Erinnerung hat. «Wir haben extrem selektionieren müssen!» Nicht auszudenken also, wie der Redigaffi aus einem grossen Jahr schmeckt. Bravo! 95/100 Punkte James Suckling: Fantastic aromas of red pepper, chocolate, chili, and blueberry. Medium to full body, fine tannins and a beautiful length and balance. A triumph for a difficult vintage in 2014. And the 20th vintage of this great pure merlot made. I am not sure I would wait on this one. Too delicious now.